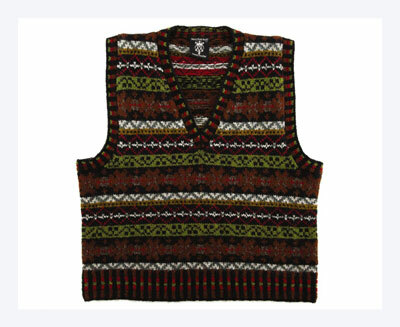 Named for a shady ravine on Fair Isle, this vest is a classic example of traditional Fair Isle knitting. 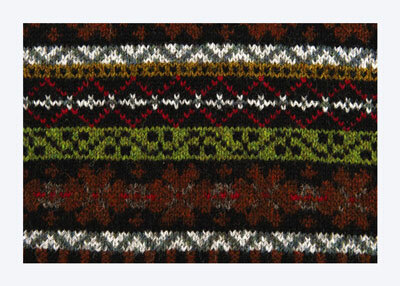 Seven colors of two-ply wool create a cohesive knitted fabric, while crocheted steeks provide a simple and elegant steek finishing technique. Finniquoy is designed in a modern, short length, which ends at the natural waist. For a more traditional look, increase the body length below the armholes by approximately 3–4”. With MC and smaller circular needle, CO 240 (256, 272, 288) sts. Work rows 1–18 of Lower Band Chart. * With larger circular needle, work rows 1–40 of Body Chart, beg at point indicated in chart for your size. Rep from * until piece measures 10 (11, 12, 13)” from beg. Place 24 (28, 32, 36) underarm sts on either side of body on waste yarn holders. CO 7 steek sts for each underarm, PM on either side of each steek — 192 (200, 208, 216) sts. 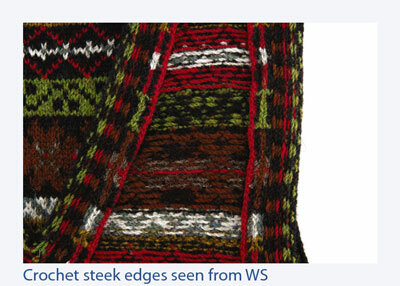 Steek sts are excluded from stitch counts. 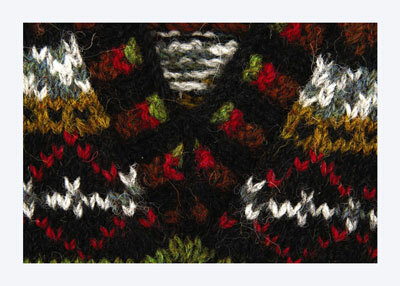 Next row — work armhole dec: *K1, k2tog, work to last 3 sts before steek, ssk, k1. Work steek sts, k1, k2tog, work to last 3 sts before steek, ssk, k1. Rep from * every other rnd 7 (7, 9, 9) more times. Read ahead; neckline shaping begins before armhole shaping is complete. 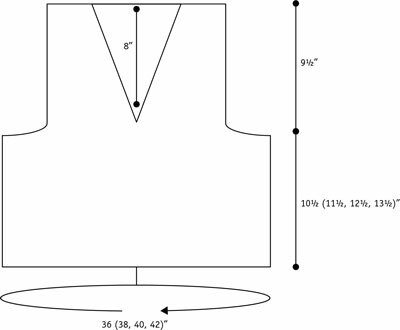 Start neckline shaping when piece measures 11 (12, 13, 14)” from beg. Hold center front st on waste yarn. CO 7 steek sts and PM on each side. Next rnd: Work neckline dec: *Work to last 3 sts before neckline steek, k2tog, k1, work steek sts, k1, ssk, work rem of rnd. Rep neckline dec from * every 3rd rnd 19 more times—119 (127, 127, 135) sts. Work even until piece measures 20 (21, 22, 23)” from beg. Next rnd: Place 20 (22, 22, 24) sts on waste yarn holder for left front shoulder. BO 7 neckline steek sts. Place 20 (22, 22, 24) sts on waste yarn holder for right front shoulder. 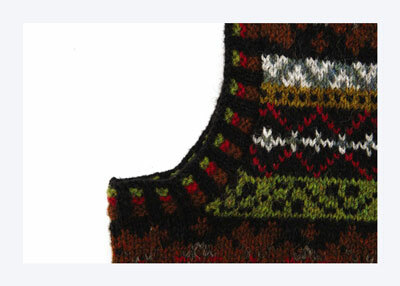 BO 7 right armhole steek sts. Place 20 (22, 22, 24) sts on waste yarn holder for right back shoulder. Place 39 sts on waste yarn holder for back neckline. Place 20 (22, 22, 24) sts on waste yarn holder for left back shoulder. 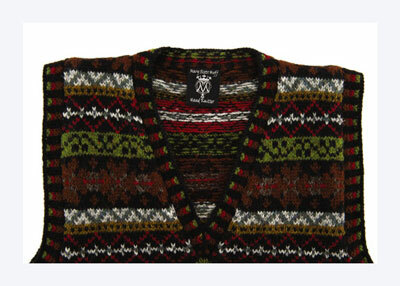 BO 7 left armhole steek sts. Secure steeks using crochet method. Join held shoulder sts from WS using 3-needle BO. With smaller 16″ circular needle and MC, pick up and knit 148 (152, 156, 160) sts around left armhole (adjoining steek edge), beg at center of held underarm sts. Work rows 1–7 of Upper Edge Chart. BO loosely. Rep steps 1–2 for right armhole. With smaller 16″ circular needle and MC, pick up and knit (adjoining steek edges) as follows: CF held st, 52 sts along right front neck edge, 39 held back neck sts, 52 sts along left front neck edge — 144 sts. 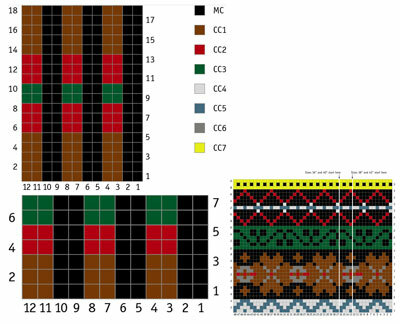 Work rows 1–7 of Upper Edge Chart, creating mitered decreases at CF by dec 1 st on each side of CF st on every row. BO loosely.